Read the great story of a UK navigator at a Wellington bomber during WW II.Thank you very much William for contacting me and share with us this amazing story and passport of your father. 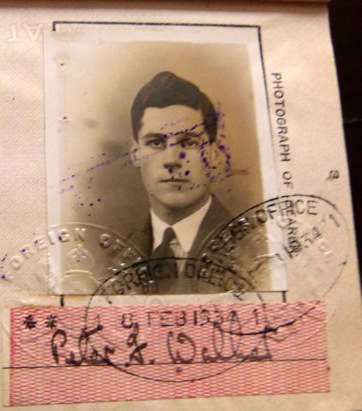 Peter Walker was born in 1915 on Christmas eve.He went to Hotel college in Lausanne during the pre-war years, leaving for England in July of 1939 before the Nazi invasion of Poland and the beginning of WW II. Joining the British air force, he was a navigator in a Wellington bomber and shot down over occupied France on his 1st. mission. By a staggering coincidence, he was captured by two Germans with whom he had been at hotel college in Switzerland. Peter`s captors managed to organise for him to be flown to prison camp. Since Peter spoke perfect German and French (hotel college) and carried a small suitcase with razor blades, soap etc., he was interrogated by the British! He became camp interpreter in Stalag Luft III (great escape camp) where he persuaded a camp guard to lend him, over a period of 5 years,a camera to photograph general life in the camp. Liberated by the Swiss lead team in 1945, he gave the reels of film to a Swiss liberator asking him to forward the rare film to his English address as he thought he might loose them. 6 months after V-day, a parcel arrived with all his photos, the Swiss liberator had them developed and printed! (they are all stamped by the Geneva Convention). We, as a family, have the complete photographic record at home. My father, Peter Walker, has recently had to go into a home for the elderly, he is 96 years old. Stalag Luft III (Stammlager Luft, or POW Camp for Airmen #3) was a Luftwaffe-run prisoner-of-war camp during World War II that housed captured air force servicemen. It was in the German Province of Lower Silesia near the town of Sagan (now Żagań in Poland), 100 miles (160 km) southeast of Berlin. The site was selected because it would be difficult to escape by tunneling. The camp is best known for two famous prisoner escapes that took place there by tunneling, which were depicted in the films The Great Escape (1963) and The Wooden Horse (1950), and the books by former prisoners Paul Brickhill and Eric Williams from which these films were adapted.